Handground is the product of some visionary Americans and a whole crowd worldwide. 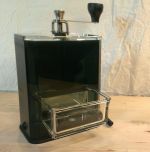 The design and functions of the Handground coffee grinder were consulted on via Instagram and Kickstarter with coffee lovers around the world contributing views and ideas on everything from the mechanics to the aesthetics of the grinder. 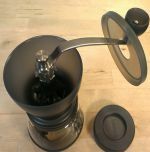 The control over grind size is numeric rather than pure guesswork - there are 15 grind-size settings, with a guide wheel suggesting numbers suitable for different coffee making processes. The upper chamber is calibrated for your beans (though you may still want to weigh them first). 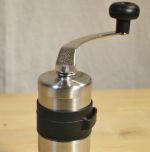 The handle is parallel to the grind shaft to facilitate an easier grind. 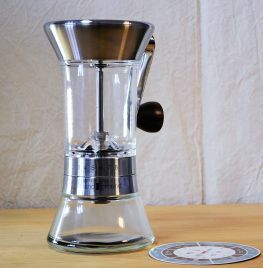 The nickel edition which we stock is a superb finish for a coffee grinder.